We know that sometimes it’s just not possible to keep a pet. But before making the decision to surrender a pet, please consider all of your options. Contact our behavior consultants at training@awla.org or call 703-931-9241 during our open hours. Our counselors may be able to help you solve the problem. Or go to our Pet Care and Training page for information on a wide range of pet issues. Many problems can be improved by having your pet spayed or neutered. We can help! Go to our Spay and Neutering page to learn about the many resources available. Reach out to friends and relatives who might be able to give the pet a loving home. If you must surrender a pet, please follow the advice below. 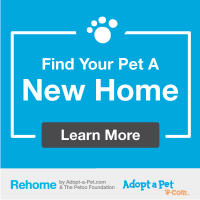 Other resources include Get Your Pet, an online community that directly connects people who need to give up a pet with people who want to adopt or Rehome available through the link below. DO call your local animal shelter or humane society first if you live outside of Arlington County. We may not have the space immediately to accept surrenders from people residing in other jurisdictions. DO call the League if you have exhausted all other possibilities. If you have tried all other options and have decided to surrender your pet, we are here to help. If you are a resident of Arlington County or the City of Falls Church, we can take your pet by appointment. Please call us at 703-931-9241 during open hours (except Saturday and Sunday) to discuss surrendering your pet. We will ask a few questions to help determine if your pet is a good candidate for our adoption program. We will not place an animal for adoption that is a danger to the community. During this conversation, you can make an appointment to surrender your pet. We only accept owner-surrendered animals from 1:00 PM-5:00 PM on Monday, Wednesday, and Thursday, and 1:00-3:00 PM on Sundays. We ask that you make an appointment during one of these days so that we can best care for your animal when it comes to the shelter. Unfortunately, we cannot accept owner surrenders on Tuesdays, Fridays, or Saturdays. You will be required to sign a release form giving the League legal ownership of the animal. Once you have signed the release statement, you may not reclaim your pet, so please be sure that you have made the right decision for you and your pet. You are welcome to call the League to check on the pet’s status. It is extremely important for you to obtain your animal’s medical records and bring them with you. A lack of medical information can delay the time it takes to evaluate your pet, and thus delay its availability for adoption. We will ask you to fill out a “personality profile” about your pet. The information about its health, behavior, habits, likes, and dislikes is really helpful to people considering your pet for adoption and helps us decide what kind of home would be best for it. You can download the surrender profile for cats, for dogs, or for small companion animals and bring it in with you. Please be honest when answering these questions; let us know if your pet has a history of biting, refuses to use the litter box, has a serious or chronic medical condition, or any other problem. It is unfair to pass on severe behavioral or medical issues to another family. Please call us at 703-931-9241 to discuss surrender options (we cannot provide emergency veterinary services). We are also not able to perform owner present euthanasia.